Writing about a young Mississippi high schooler, Jason McFarlin saw big things ahead. McFarlin watched the teen first baseman as a guest scout at the All-American Pro Day Showcase. The youngster was fun to watch, McFarlin wrote in his report. "This young man is very strong, and has the ability to win ball games with a single swing of the bat," McFarlin wrote in the report available at SMWWScout.com. "He most impressed me in batting practice, he was hitting homers off his fist." McFarlin wrote as someone who was once scouted himself and, at least one team thought highly enough of him to take him in the third round. The Giants selected McFarlin out of Pensacola High School. McFarlin also wasn't as much of a power hitter as the player he was scouting at the showcase, McFarlin was notable for his speed, stealing as many as 73 bases in a season. But in a professional career that spanned nine seasons, McFarlin never stole a spot in the majors. 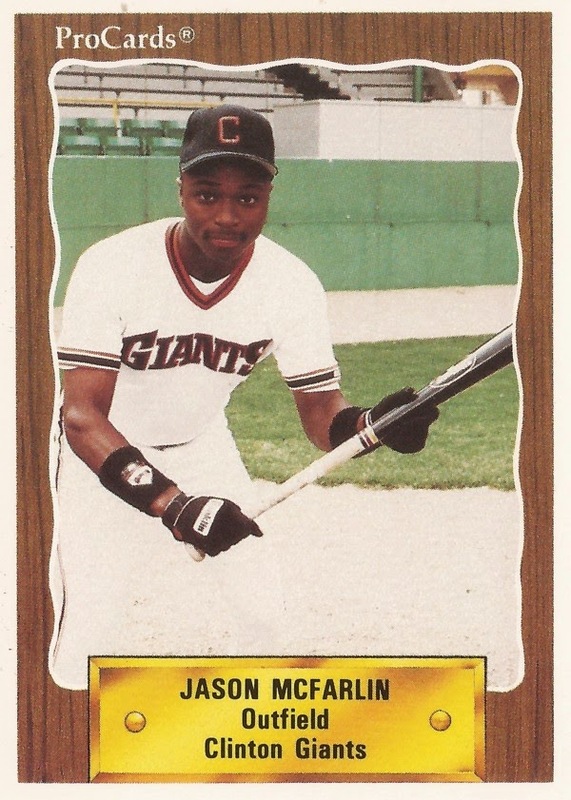 After his selection by the Giants in 1989, McFarlin played at short-season Everett. In 37 games there, McFarlin hit no home runs and stole just seven bases, hitting .260. He sped up for 1990, however. McFarlin hit at a slower clip with the single-A Clinton Giants, but picked up his speed. He hit .227, still without a home run. But he also swiped his career-best 73 bases. McFarlin made it to high-A San Jose in 1991, swiping another 46 bags. He also hit two home runs. He made AA Shreveport for a time in 1992 and 1993, making Shreveport full time in 1994. That year, he hit .284 with five home runs and 21 stolen bases. He returned to Shreveport for 1995, hitting a stellar .337. But his speed began to slow down. He stole just eight bases. It was his final season in the Giants system. His next year was his last in affiliated ball. But he also got his only taste of AAA. He played most of the year with the Braves at AA Greenville. But he also played five games in the Rangers system, two at AA Tulsa and three at AAA Oklahoma City. In 12 at bats at AAA, McFarlin got two hits and no stolen bases. McFarlin took one more look at professional ball, in 1998. He played 10 games for independent Sonoma County of the Western League. These days, McFarlin is listed as a baseball scout for Sports Management WorldWide, based in his hometown of Pensacola.